Blue Sky Energy was the first company to really pursue the Maximum Power Point Tracking (MPPT) market with their line of Solar Boost charge controllers. Given the right conditions (low battery voltage and cool ambient temperatures), these controllers can increase your solar array's charging current by 30% or more as compared to other conventional charge controllers. 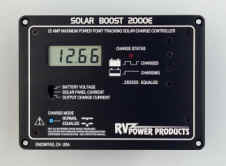 There are 4 basic models of the Solar Boost charge controllers, one meant for 12V RVs or small cabin systems (SB 2000E) and the other three designed for medium to large home or commercial PV systems. These larger controllers can charge a lower voltage battery from a higher voltage array (ex. a 24V solar array can charge a 12V battery bank) which reduces the necessary wire size from the solar array to the controller which can save a lot of money. All of the Solar Boost charge controllers are covered by a 3 year limited warranty and all but the small SB2000E are ETL listed to UL standard 1741. The SB2000E is a 12V 25A MPPT charge controller that is ideal for use in an RV or small cabin system. It's small size (4.625" x 6.375" x 1.825") and its flush mount design make it easy to install in an out of the way spot. It has an LCD display that toggles between battery voltage, array current and output (i.e. boosted) current with the flick of a switch. It also has a manual equalization function and a "charge status" LED that will indicate what stage of the charging cycle it is in based on the sequence of flashes. An optional battery temperature sensor is available along with a wall mount box for installations where flush mounting is not possible. 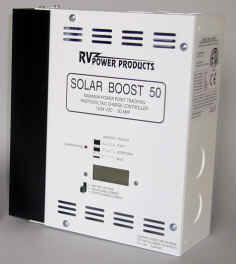 The Solar Boost 50 was the first high capacity MPPT charge controller that Blue Sky Energy came out with. They have since added the SB3048 and the SB6024H to their impressive array of MPPT controllers. All three of these controllers feature the same 3-stage PWM/MPPT charging algorithm as in the SB2000E which can increase your power production by up to 30% given the right conditions (low battery voltage and cool ambient temperatures). The SB50 has a 50 amp output capacity and it is field selectable for 12 or 24V systems. You can even setup the SB50 to charge a 12V battery bank from a 24V array which keeps your voltage drop and wiring costs down. The SB3048 has a 30 amp output capacity and is field selectable for 24 or 48V systems with the option of charging a 24V battery bank from a 48V array. The SB6024H has a 60 amp output capacity and is a "high voltage input" controller that can only accept 48 or 60V nominal solar arrays (4 or 5 solar modules wired in series) and will charge a 12 or 24V battery bank (field selectable). All three of these controllers are identical in size and appearance and can be fitted with an optional front or remote mounted LCD that toggles between battery voltage, array current and output (i.e. boosted) current with the flick of a switch. They also have a manual equalization function and a "charge status" LED that will indicate what stage of the charging cycle the controller is in based on the sequence of flashes. These controllers are indoor rated, ETL listed to UL standard 1741 and they feature a powder coated white finish with enough knockouts on 3 sides to make installation a breeze. While MPPT charge controllers may seem expensive at first, when you consider what they can do for you in terms of decreased wiring cost and higher daily energy production, they quickly make up the difference over less expensive controllers.